Developing effective cancer treatments remains one of the most important challenges for healthcare, and T-cell based immunotherapy has provided some very positive recent advances in cancer treatment. Cytotoxic T lymphocytes (CTLs) can circulate through the body and are capable of identifying and eliminating tumorigenic cells. The recognition of tumor depends on the specific interaction between the T-cell receptor of CTLs and Human Leucocyte Antigen (HLA) class I molecules at the tumor cell surface, which binds and displays peptides derived from intracellular proteins. Peptide-HLA complexes are presented by all nucleated cells, constituting an efficient surveillance mechanism by which the immune system can recognize aberrant changes within cells of the body. Al- though CTL surveillance likely evolved to eliminate virally-infected cells, this system also provides very promising opportunities for cancer treatment and specifically the development of immune-based therapies. However, such therapies must be highly personalized since most of these tumor-associated peptides are patient-specific. This is due mainly to the high level of HLA diversity within the human population, combined with the fact that each person’s tumor acquires unique genetic aberrations. A further challenge is the identification of tumor-specific pep- tides that are not also expressed by normal cells, which will likely ensure less off-target effects during therapy. Our long-term goal is to perform structure-guided selection of tumor-derived peptides with potential for immunotherapy, which will also allow structural analysis of different peptide-HLA complexes recognized by a given T-cell; this knowledge will help to prevent dangerous off-target toxicities. 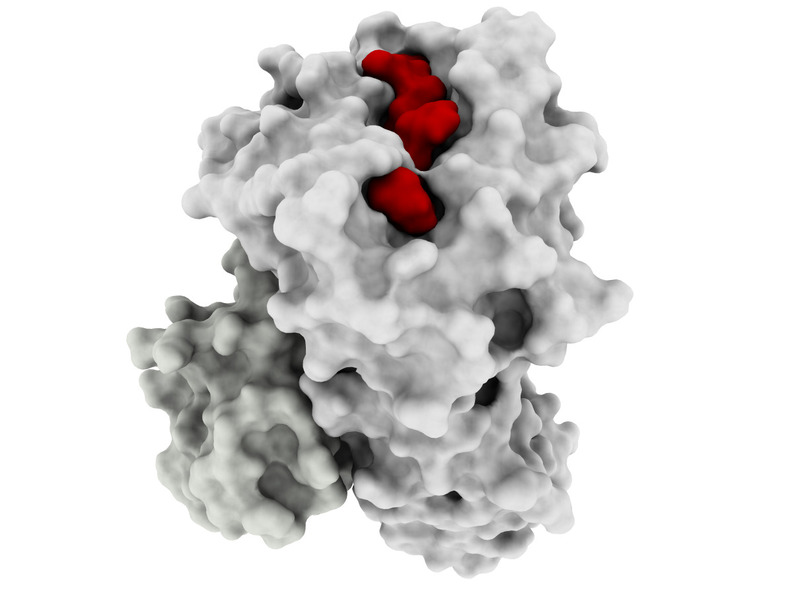 The objective of this project is to develop computational tools to enable docking-based modeling of peptide-HLA complexes, starting with HLA variants (allotypes) that are highly prevalent within human population and moving toward others that are less prevalent (for personalized treatment). Our Preliminary Data supports the need for a structural framework to improve the selection of targets for immunotherapy, since current methods have important limitations, particularly with regard to less prevalent HLAs. The central hypothesis is that structure-based analysis can be used to improve peptide target selection for individual HLA allotypes and thus facilitate the development of personalized immunotherapies for all cancer patients. Two specific aims were designed to test this hypothesis. In Specific Aim 1, a docking method will be specifically tailored to make binding predictions of tumor-derived peptides to two highly frequent and well- studied HLAs, HLA-A*2402 and HLA*A1101, collectively expressed by >55% of the world population. In Specific Aim 2, the HLA-A3 superfamily, collectively expressed by >40% of the human population, will be used as a model for extending the methods towards less well-studied HLAs. Innovative computational methods will be applied in this project and cutting-edge experimental resources will be used to train and validate computational methods. The underlying rationale is that developing a computational framework for these prevalent HLA allotypes will facilitate the development of personalized, antigen-specific immunotherapies, which would benefit a much larger number of cancer patients. This work has been supported by grant NIH 1R21CA209941. D. A. Antunes, J. R. Abella, D. Devaurs, M. M. Rigo, and L. E. Kavraki, “Structure-based methods for binding mode and binding affinity prediction for peptide-MHC complexes,” Current Topics in Medicinal Chemistry, vol. 19, no. 1, 2019. Understanding the mechanisms involved in the activation of an immune response is essential to many fields in human health, including vaccine development and personalized cancer immunotherapy. A central step in the activation of the adaptive immune response is the recognition, by T-cell lymphocytes, of peptides displayed by a special type of receptor known as Major Histocompatibility Complex (MHC). Considering the key role of MHC receptors in T-cell activation, the computational prediction of peptide binding to MHC has been an important goal for many immunological applications. Sequence-based methods have become the gold standard for peptide-MHC binding affinity prediction, but structure-based methods are expected to provide more general predictions (i.e., predictions applicable to all types of MHC receptors). In addition, structural modeling of peptide-MHC complexes has the potential to uncover yet unknown drivers of T-cell activation, thus allowing for the development of better and safer therapies. In this review, we discuss the use of computational methods for the structural modeling of peptide-MHC complexes (i.e., binding mode prediction) and for the structure-based prediction of binding affinity. D. A. Antunes, D. Devaurs, M. Moll, G. Lizée, and L. E. Kavraki, “General prediction of peptide-MHC binding modes using incremental docking: A proof of concept,” Scientific Reports, vol. 8, p. 4327, 2018.
reproducing the binding modes of 25 pMHC complexes whose crystal structures are available. The class I major histocompatibility complex (MHC) is capable of binding peptides derived from intracellular proteins and displaying them at the cell surface. The recognition of these peptide-MHC (pMHC) complexes by T-cells is the cornerstone of cellular immunity, enabling the elimination of infected or tumoral cells. T-cell-based immunotherapies against cancer, which leverage this mechanism, can greatly benefit from structural analyses of pMHC complexes. Several attempts have been made to use molecular docking for such analyses, but pMHC structure remains too challenging for even state-of-the-art docking tools. To overcome these limitations, we describe the use of an incremental meta-docking approach for structural prediction of pMHC complexes. Previous methods applied in this context used specific constraints to reduce the complexity of this prediction problem, at the expense of generality. Our strategy makes no assumption and can potentially be used to predict binding modes for any pMHC complex. Our method has been tested in a re-docking experiment, reproducing the binding modes of 25 pMHC complexes whose crystal structures are available. This study is a proof of concept that incremental docking strategies can lead to general geometry prediction of pMHC complexes, with potential applications for immunotherapy against cancer or infectious diseases. D. Devaurs, M. Papanastasiou, D. A. Antunes, J. R. Abella, M. Moll, D. Ricklin, J. D. Lambris, and L. E. Kavraki, “Native state of complement protein C3d analysed via hydrogen exchange and conformational sampling,” International Journal of Computational Biology and Drug Design, vol. 11, no. 1/2, pp. 90–113, 2018. Hydrogen/deuterium exchange detected by mass spectrometry (HDX-MS) provides valuable information on protein structure and dynamics. Although HDX-MS data is often interpreted using crystal structures, it was suggested that conformational ensembles produced by molecular dynamics simulations yield more accurate interpretations. In this paper, we analyse the complement protein C3d through HDX-MS data and evaluate several interpretation methodologies, using an existing prediction model to derive HDX-MS data from protein structure. We perform an HDX-MS experiment on C3d and, then, to interpret and refine the obtained data, we look for a conformation (or conformational ensemble) of C3d that allows computationally replicating this data. First, we confirm that crystal structures are not a good choice. Second, we suggest that conformational ensembles produced by molecular dynamics simulations might not always be satisfactory either. Finally, we show that coarse-grained conformational sampling of C3d produces a conformation from which the HDX-MS data can be replicated and refined. D. A. Antunes, M. Moll, D. Devaurs, K. R. Jackson, G. Lizée, and L. E. Kavraki, “DINC 2.0: a new protein-peptide docking webserver using an incremental approach,” Cancer Research, vol. 77, no. 21, pp. e55–57, Nov. 2017.
larger ligands such as peptides, which are molecules of growing interest in cancer research. Molecular docking is a standard computational approach to predict binding modes of protein-ligand complexes, by exploring alternative orientations and conformations of the ligand (i.e., by exploring ligand flexibility). Docking tools are largely used for virtual screening of small drug-like molecules, but their accuracy and efficiency greatly decays for ligands with more than 10 flexible bonds. This prevents a broader use of these tools to dock larger ligands such as peptides, which are molecules of growing interest in cancer research. To overcome this limitation, our group has previously proposed a meta-docking strategy, called DINC, to predict binding modes of large ligands. By incrementally docking overlapping fragments of a ligand, DINC allowed predicting binding modes of peptide-based inhibitors of transcription factors involved in cancer. Here we describe DINC 2.0, a revamped version of the DINC webserver with enhanced capabilities and a more user-friendly interface. DINC 2.0 allows docking ligands that were previously too challenging for DINC, such as peptides with more than 25 flexible bonds. The webserver is freely accessible at http://dinc.kavrakilab.org, together with additional documentation and video tutorials. Our team will provide continuous support for this tool and is working on extending its applicability to other challenging fields, such as personalized immunotherapy against cancer. D. Devaurs, D. A. Antunes, M. Papanastasiou, M. Moll, D. Ricklin, J. D. Lambris, and L. E. Kavraki, “Coarse-grained conformational sampling of protein structure improves the fit to experimental hydrogen-exchange data,” Frontiers in Molecular Biosciences, vol. 4, no. 13, 2017. Monitoring hydrogen/deuterium exchange (HDX) undergone by a protein in solution produces experimental data that translates into valuable information about the protein’s structure. Data produced by HDX experiments is often interpreted using a crystal structure of the protein, when available. However, it has been shown that the correspondence between experimental HDX data and crystal structures is often not satisfactory. This creates difficulties when trying to perform a structural analysis of the HDX data. In this paper, we evaluate several strategies to obtain a conformation providing a good fit to the experimental HDX data, which is a premise of structural analysis. We show that performing molecular dynamics simulations can be inadequate to obtain such conformations, and we propose a novel methodology involving a coarse-grained conformational sampling approach instead. By extensively exploring the intrinsic flexibility of a protein with this approach, we produce a conformational ensemble from which we extract a single conformation providing a good fit to the experimental HDX data. We successfully demonstrate the applicability of our method to four small and medium-sized proteins.